The area of north east of the village of Priddy in Somerset contains an extensive Bronze Age ritual landscape containing several barrow cemeteries rivalling those seen in Wiltshire surrounding Stonehenge. It includes the recently partially-demolished Priddy Rings, the Ashen Hill Barrow Cemetery and Priddy Nine Barrows Cemetery. Ashen Hill Barrow Cemetery consists of six bowl barrows and two bell barrows aligned west to east ranged across the ridge line of a pasture field. They date to the Bronze Age (c. 2000-700 BC) and early excavations showed them to contain a variety of cremation burials and some other finds. It can be easily accessed by public footpath from the village of Priddy. The barrows here were partially ‘excavated’ in September 1815 by Rev. John Skinner, a parish vicar and amateur antiquarian and archaeologist operating mainly in the area of Bath and the villages of northern Somerset. 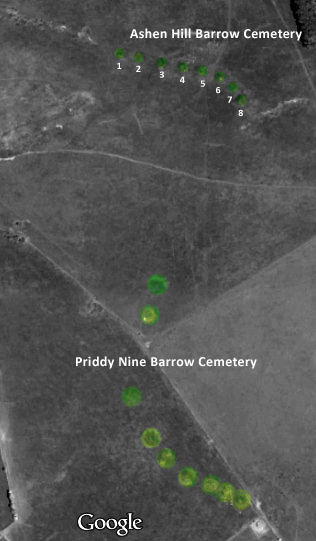 Barrow #1: A cremation burial but no finds. Bowl Barrow #2: A central cremation burial with part of a bronze blade. Bowl Barrow #3: A cist containing a possible primary cremation and a large broken decorated urn. Bell Barrow #4: No finds were reported from Skinner’s excavation but a subsequent excavation in 1894 by the Wells Natural History and Antiquarian Society uncovered four cremations as well as finds of worked flint blades and a barbed and tanged arrowhead. Bowl Barrow #5: A cist or stone grave containing a cremation burial and a bronze spearhead. Bowl Barrow #6: A cremation burial located in a cavity covered by a flat stone within 15cm of the summit of the mound. An earlier cremation burial and inverted ceramic urn located in a cist was also reported. Bell Barrow #7: A small cist covered by a flat stone which contained a cremation burial and five amber beads. Other finds reported included part of a bronze spear or arrowhead, a bronze ring, and a perforated blue opaque glass bead. Bowl Barrow #8: Two cremation burials located just below the Bronze Age ground surface, set in an oval cist and covered by a flat stone as well as a broken ceramic urn. Priddy Nine Barrows is a group of 9 bowl barrows in a wider cemetery of around 30, dating to the Bronze Age (c. 2000-700 BC). It is located just 200m south of Ashen Hill Barrow Cemetery. 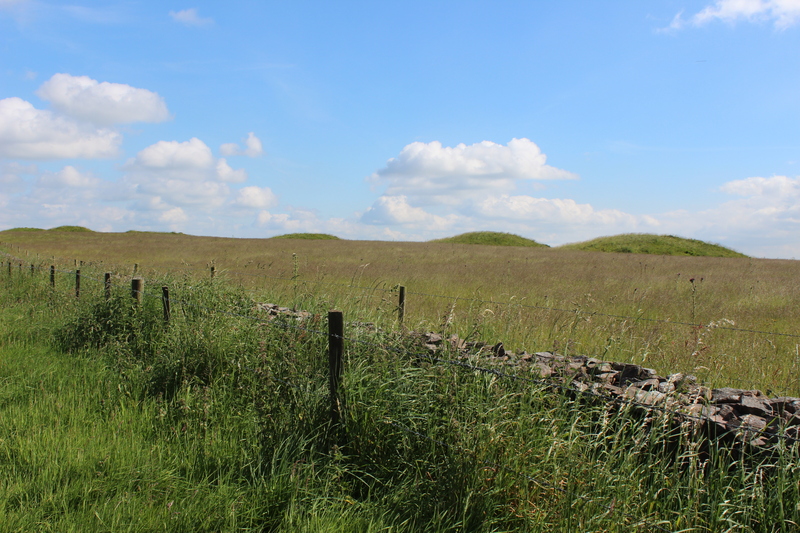 The areas between the barrow mounds appears to survive undisturbed and is believed likely to contain further burials in the form of flat graves and urnfields in addition to evidence for Bronze Age occupation. As with Ashen Hill Barrow Cemetery, Rev. John Skinner also conducted partial excavations of Priddy Nine Barrows though nothing is known about the finds which may have been uncovered. These barrows are on private land, but a footpath runs along the field boundary allowing a good view of them all. If you want to visit the barrows, park on the village green in Priddy and follow the footpath up Nine Rings Lane. There in a stile into the field containing the Ashen Hill barrows, though you won’t see the line of them until you’re on top of the first. 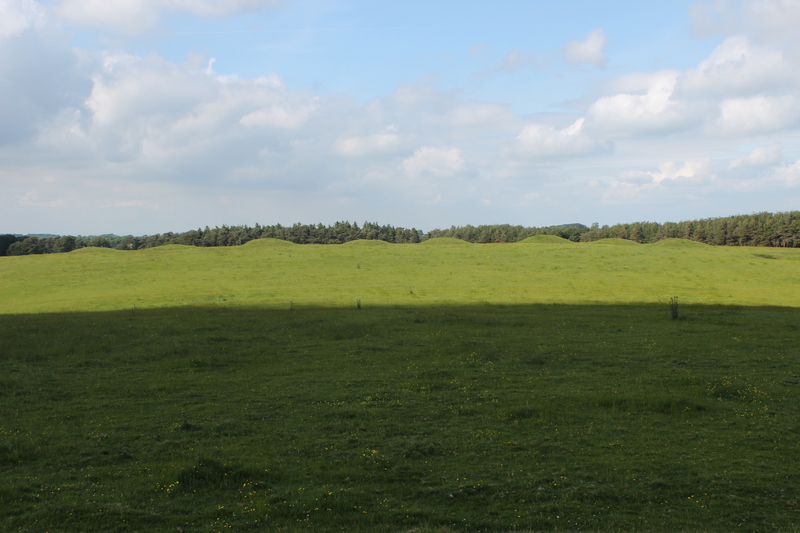 There is a good circular walk here which also takes in the nature reserve to the east of Priddy Nine Barrows. I just found this information on twitter so decided to look it up as I had not heard of these Barrows before and I was interested as to which period they were, Iron age or Bronze Age. Nice post Thank you.